According to the Vacaville police department, five men were nabbed Friday, June 3, 2016, after they were spotted wheeling out a cart full of allegedly stolen Red Bull and loading it into a U-Haul. 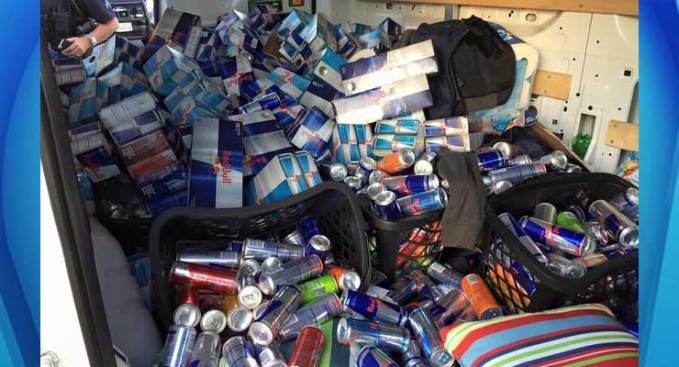 Red Bull may give you wings, but five Oakland men won't be flying anywhere after being arrested for allegedly stealing $4,700 worth of the energy drink. According to the Vacaville police department, five men were nabbed Friday evening after they were spotted wheeling out a cart full of allegedly stolen Red Bull and loading it into a U-Haul. The men have been identified as Ronnie Yarbrough, 30, Torn Saelee, 19, Jafar Neal, 29, and Jabari Neal, 29. The fifth suspect is a juvenile and his identity has not been released. All of the men are from Oakland, police said. Pictures taken by officers show the U-Haul van packed with the energy drink. Police say the Vacaville grocery store was not the only place the alleged thieves visited. "After searching the van, it was evident that our local grocery store was only one of many the crew had graced with their presence," Vacaville police wrote in a Facebook post. The four adults have been booked into Solano County Jail. The minor allegedly involved in the theft has been booked into juvenile hall.